Gear Testing Guru - Well it's official, I am Maine's FIRST Cabela's Gear Tester! I received word from corporate a few weeks ago and had been holding back posting until I was able to get back from by statewide motorcycle tour (trip report soon!). I received note that my first test "item" should be arriving sometime next week. I could tell you what it is but according to the lawyers at Cabela's I would then have to kill you. 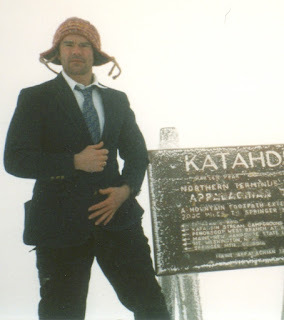 :) I sent this picture to Cabela's corporate showing me "working" on top of Katahdin in January of 2005 . . . they loved it! LOL!